Take the entire family out to breakfast and help the children of your community at the same time! The Kiwanis Club of Zion-Benton is hosting its 35th annual Pancake Breakfast fundraiser on Saturday, March 9, 2019. Breakfast will be served from 7:00 a.m. to 12:00 p.m. at Zion-Benton Township High School (south entrance). Breakfast includes all you can eat pancakes, along with sausage, milk, orange juice and coffee. Carry-outs are available. There will be fun for the entire family! Activities include balloons, Pick-A-Prize and 50/50 raffles, bake sale, an ornament sale, and Balloons by Amber! Tickets are available from any Kiwanis member or at the door. Tickets cost $7 for adults and $5 for kids 10 and under. Save money and buy a 10-pack for $60! 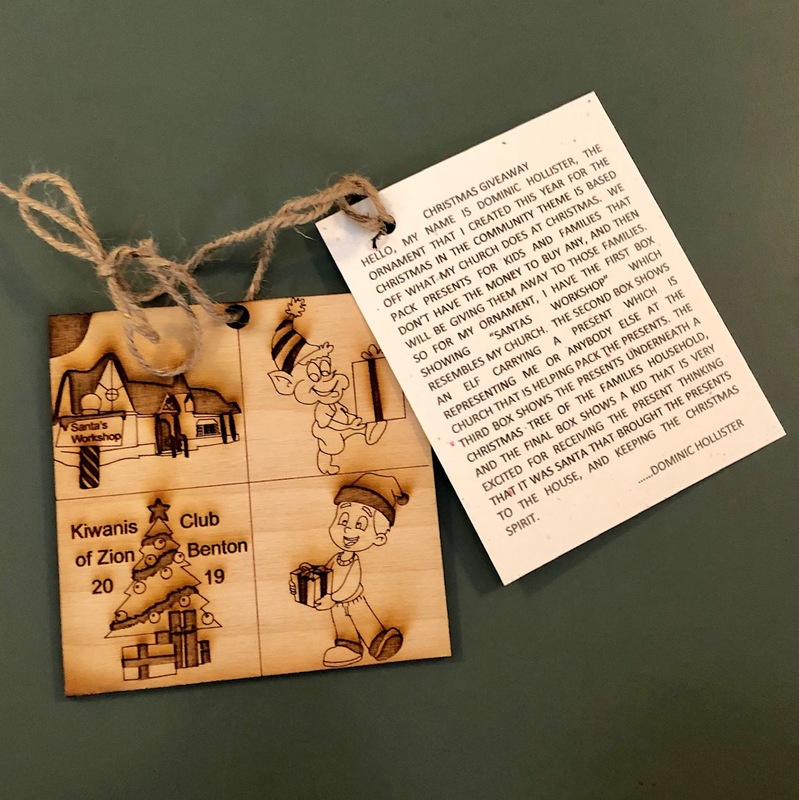 This year, eight students from the ZBTHS Industrial Technology class submitted designs for the club’s annual ornament fundraiser. The winning design, Christmas Giveaway, was created by Dominic Hollister. Ornaments are available for purchase from any Kiwanis member and at Inn at Market Square in Zion for only $5 each. Read more…. Saturday, October 27, 2018 recognized as Kiwanis One Day – a global action day of service benefiting children and communities. The Kiwanis Club of Zion-Benton is bringing the spirit of service alive by hosting a basketball camp for local children on Saturday, October 27, 2018. The club selected this project to engage local boys and girls in grades K-8. A $5 registration fee includes camp, snacks, a t-shirt, and awards. The camp will be held from 11 AM-1 PM at the Zion Park District Leisure Center at 2400 Dowie Memorial Drive in Zion. Click here to download a registration form. The Kiwanis Club of Zion-Benton honors local firefighters and police annually. Honorees are chosen by their peers and are awarded with the Lee J. Fischer Firefighter/Police Award at an annual banquet, held in September. Click here to learn more about Lee J. Fischer. Click here for a list of award recipients.